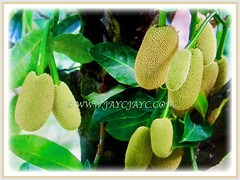 Chempedak or Champekak is well known for bearing the largest fruits of any tree in the world. 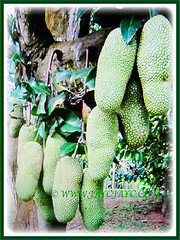 The large fruits are able to reach as much as 35 kg in weight, 90 cm in length and 50 cm in diameter. 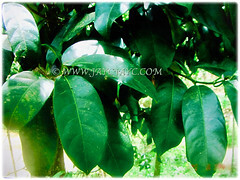 It is a popularly and widely grown tree, primarily for its sweet and aromatic fruits. Botanical Name: Artocarpus integer (syn. : Artocarpus champeden, Artocarpus integrifolius). Common Names: Chempedak, Cempedak, Campedak, Champedak, Chempedak Utan. Etymology: The genus name Artocarpus is derived from the Greek words artos, meaning bread and karpos, meaning fruit, referring to the bread-fruit tree. The specific epithet integer is from Latin, meaning undivided, entire, intact or whole. Origin: Native to Southeast Asia including Myanmar, Peninsular Thailand, Malaysia, Singapore and from Indonesia to the Island of New Guinea. It is also cultivated elsewhere around the globe. Plant type: An ornamental and perennial tree with edible fruits. Features: Artocarpus integer is from the genus Artocarpus that consists of approximately 60 species of trees and shrubs. A fast-growing and evergreen tree with a dense crown that can reach up to 20 m tall, although most only reach between 12-14 m.
Its trunk is bumpy with a grey-brown to dark brown bark. All parts of the tree contain a milky latex when cut. Although symmetrical and conical in shape in nature, in cultivation it’s often irregular. Its evergreen and alternate leaves are obovate to elliptical in shape, 5-25 cm long and 2.5-12 cm wide with entire margins. The medium green leaves held on 1-3 cm long petioles are usually covered with hairs on the midrib and main veins. New shoots, leaf and flower stalk are covered with thin but wiry brown hairs. It is monoecious, bearing both male and female flowers on the same tree. The flowers are borne on solitary stalked inflorescences that can be at the leaf axils, on the tree trunk or on the branches. The male flowering head is cylindrical in shape, 3-5.5 cm long and 1 cm wide, and is yellowish-white in colour. Most male heads are formed on shoots in the periphery of the canopy that may facilitate pollination by wind. The female flowering head is similar but with distinct filamentous styles on it. The small and greenish female flower heads are found only on cauliflorous shoots. Flowers are cream or off-white and located axillary. Insects visit the scented male inflorescence but not the female ones as they lack nectar. Fruit growth is rapid during the 1st week following stigma emergence. Stigmas remain receptive for 1-2 weeks. Maturation time is usually 3-6 months.Its stalked fruits are cylindrical to almost round in shape, 20-35 cm long and 10-15 cm wide. They are yellowish-white to orange in colour when ripe, very sweet and fragrant. 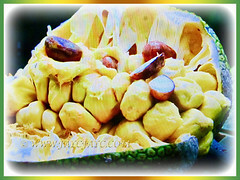 The outer layer of the fruit is green, thick, leathery and patterned with hexagons that are either flat or raised protuberances like the Jackfruit’s skin. The seeds are covered by an orange aril that tastes sweet and pungent. Each fruit contains many kidney-shaped seeds. The syncarp may be cylindrical to spherical in shape, and ranges from 10-15 cm across and 20-35 cm long. Fruit heads hang on thick stalks from the trunk and main branches. When ripe they are roughly oblong, about 25-45 cm long. Ripe fruits has a strong scent. 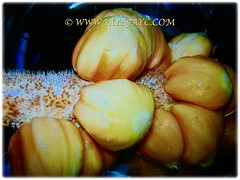 The thin and leathery skin is greenish, yellowish to orangish brown and divided into small hexagons that are either smooth or covered with small protrusions. It is cylindrical in shape, 25-45 cm long by 10-15 cm across and weighing 1-6 kg. 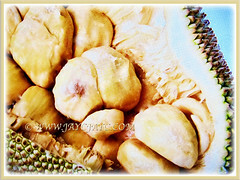 The fruit’s taste is similar to the related Jackfruit (Artocarpus heterophyllus) with a hint of durian. 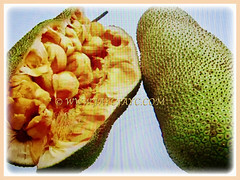 Compared with Jackfruit, Chempedak is sweeter, aromatic, less fibrous and less acidic. 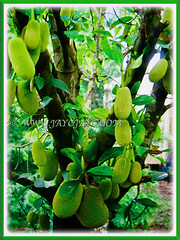 Like the Jackfruit, it is a syncarp, composed of fleshy arils or segments, 3-4.5 cm across, colored pale yellow, yellow, orange or green. Each aril surrounds a seed that is edible by boiling or roasting. Its seeds are flattened spheres or elongated, about 2-3 cm long. 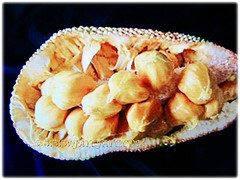 Unlike Jackfruit seeds, they have a thin and edible seedcoat. The vigorously growing tree can bear heavy crops of fruit in 3-5 years after planting. Culture (Care): Artocarpus integer or Chempedak can be grown easily with least maintenance. Moisture: Moderate water requirements. Water regularly and thoroughly as it prefers a moist soil. Avoid overwatering. Somewhat drought-tolerant once established. It loves a high humid environment. Soil: Humus-enriched, loamy, acidic and well-drained soils. However, it does best in deep alluvial soils of open texture. Others: Young trees with thin stems may be damaged by wind. Feed the plant with a balanced slow-release fertiliser for fruiting plants once every two or three months. Mulch around the tree to prevent the growth of weeds. Generally free from serious pests and diseases. Insects aren’t a problem as the leaves are protected by wiry hairs and immature fruits have latex in them. However, the bark is susceptible to disease attack and young fruits by fruit borers. Hanging fruits are attractive to wildlife such as turkeys and omnivorous mammals that may devour the fruits before you’re able to harvest them. Artocarpus integer or Chempedak is mildly hardy, surviving short frost and temperature to -2.22°C for brief periods. Young trees will be killed by any frost. During early years of growth, weeds around the tree trunk should be controlled manually. Mulching is recommended to reduce weed growth around the trunk base and also to conserve moisture. This plant is suitable for growing indoors. It flowers in spring and the fruit matures between 3-6 months later. Propagation: Easily propagated from seeds that start bearing fruits after 3-6 years. 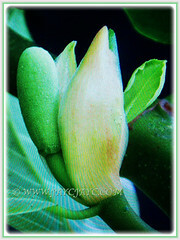 Also, it can be propagated by budding or grafting. 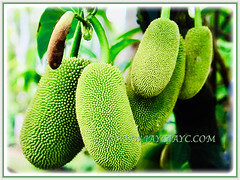 Usage: Artocarpus integer or Chempedak is suitable to be planted in parks or small gardens for its edible fruits, seeds and leaves. The orange, sweet and aromatic fruits can be consumed fresh, fried, for making jam and also used in cake mixture and desserts. The immature fruits can be cooked and eaten as a vegetable or made into pickles. Even the young leaves can be eaten as a veggie. The edible seeds can be fried, boiled or grilled and eaten with a pinch of salt. Fritters are made by dipping arils in batter and frying in oil. The wood from the tree is an excellent quality that’s as strong and durable as teak. Thus, it is often used as building material for home furnishings and boats. Its fibrous bark can be used to make ropes while latex is used in the preparation of lime. The tannins extracted from the heartwood produce a saffron-coloured dye that is used to colour the robes of Buddhists. Its fruits are eaten by small to large forest mammals.